There is no BS line. The only BS is from this website. Millenium extension is $2.8 billion not $3.5 billion. It makes more sense to extend an existing line than build a new line that forces you to transfer. It will be extended to UBC. An announcement is coming soon. In 2030, it will be possible to ride the skytrain from UBC to Langley. Zwei replies: The cost of the BS Line is now realistically $3.5 billion not including cars, it is only funded to $2.8 billion. One will still have to transfer from SkyTrain to bus at Arbutus. As for Taking SkyTrain to Langley to UBC, where is the $10 billion in funding? $4 billion to complete the BS Line to UBC; $2 billion for SkyTrain to reach Langley and the long awaited $3 billion rehab of the Expo and Millennium lines; and a billion for more and additional cars, another maintenace centre, etc. Maybe not $3.5 Billion however $3.1-$3.2 is definitely a possibility due to delays in procurement and final design. Not to mention, the constant increase in the price of structural concrete and the 25% import duty on the spealized steel products needed for the project for whichever corporate entity, ends up building the first stage of the Broadway Line at the end of the P-3 process. Zwei replies: One of Translink’s minions let slip that the cost for the subway to Arbutus may cost as close as $4 million. This was soon caught and the quote has disappeared but I read it as well as a few other transit types. An eye opening moment. Actually Zwei, I have a pretty good idea how they got that price of nearly $4 Billion . It all depends on what part of the proces you are in. At certain parts of the process in the building of these underground rail lines an estimation of how bad it could be, is done. That’s where they are, I believe. Remember, it’s a short line they will need at most 8 to 9, 4-section Skytrain trainsets. That includes 1 or 2 spares. That’s $100 million at the worst, if you want to include the price of the trains. I feel pretty confident that $3.1–$3.2 is close. The price of even $3.6 Billion means a per km cost of over $600 million, which would be the single most expensive rail transit tunnel in Canadian history, especially if you are expected to start digging around 2020. 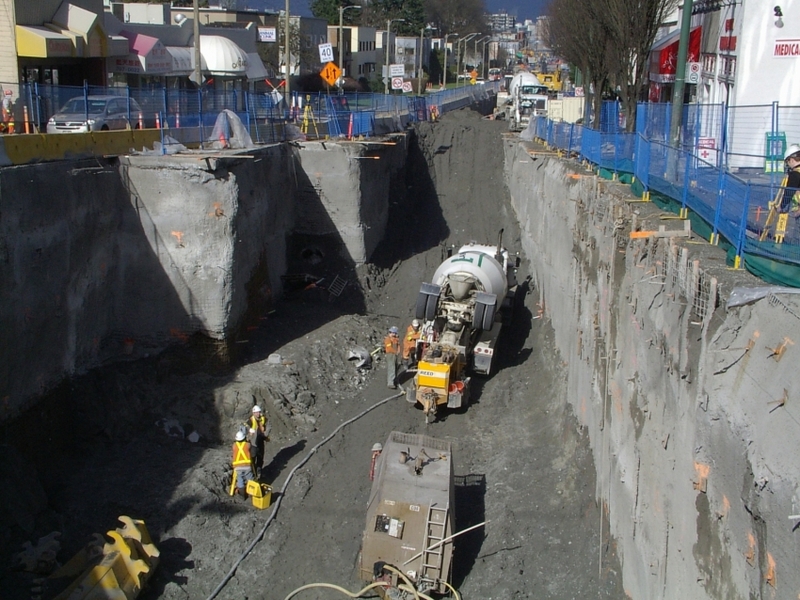 Considering, the width of Skytrain tunnels that have been built in the past, even the single level non-stacked tunnels and the expected depth of the Broadway tunnels, anything higher than $3.4-$3.5 Billion means, there has been a massive scope change and or something has gone horribly, horribly wrong. Which would stop the whole project cold, under the federal P-3 process. Now, if you delay building of the tunnel by 3 or 4 years or drastically change the design characteristics, safety tolerances, number of, or design of, the station access points and project scope then yes, $3.6-$4 Billion is very possible. However, I think we would have heard rumblings much sooner of these kind of huge, huge cost increases. What I believe you are now hearing is the classic case of “buyer’s remorse”, which often occurs at this point (final engineering and design/pre construction procurement) of many large construction projects. The reality of the total cost of $7 Billion (for both stages of the Broadway extension) is probably taking hold. This is the really important focal point here, $7 Billion for a below grade, 13 km light metro line, with dubious claims of ridership and ability to attract future customers. I personally think that, many of the claims against SNC Lavlin are mainly political and overblown however, one thing that SNC Lavlin has been caught doing in the past, is overstating numbers to make their projects look better. Zwei replies: There was a train of thought (pardon the pun) that the line to UBC be the Canada Line with a “Y” junction at Broadway. It was felt this would attract more ridership than extending the M Line. But it was quickly shelved because of capacity and technical issues with the Canada line (oh those 40m long station platforms being one). Our politicians are so in love with SkyTrain, one wonders if Bombardier has revealing photos to blackmail them. Any form of serious debate is forbidden and the big dig is about to start. Zwei, you would be most surprised just how quickly politicians can fall out of love with a transit operating technology. Especially, when a new technology is tried out in their ward, district, riding, etc, etc, you get the idea. That’s why I was so disappointed when Surrey’s LRT was shelved in favor of Skytrain. True, it was not a stellar design and network but the people of Surrey were getting over 27 km of service, new modular LRV’s with easily expandable stations, a new operations and maintenance facility and a expandable storage yard, for the same price, maybe and it’s a big maybe, as 16 km of Skytrain, not including new trains or a badly needed maintenance facility and storage yard located near the end of the line close to Surrey. Wow, Surrey you got severely screwed by loosing LRT. Zwei replies: It is even getting more bizarre as former premier Harcourt is musing on really silly stuff. It is so depressing as congestion in the lower mainland is endemic, the roads are clogged and gas is at $1.68 a litre. Yet the public seems to eat this stuff up.